Guilford Lakes was originally a 2 hole course that was expanded to 9 holes in the 1930s; shut down in 1989, and reopened in ’99. With not many golf courses on the shoreline I am sure many are happy it reopened. Its better to have a 9 hole par 3 than nothing at all. Doesn’t hurt that it is the nicest manicured par 3 in the state. Not much to talk about with a short track like this but like I said its in great shape so not a bad spot to work on your short game. I would say that #4 is my favorite; with it’s firm green nestled between a bed of rocks and water to the right. Rates are 15/17 for non residents so why not go walk it with your buddies and get a cash game going. Tee times can be made on their site or on Golf Now. Grassy Hill is an average course with above average greens. The course consists of three bunches of holes. Holes 1-2 and 8-9 go back and forth and are behind the pro shop. Hole 3 is a down hill par 3 that sends you to the “lower” holes(4-7, and ,17-18). My favorite group of holes are 11-16 which are across the road. 11 requires a good drive to clear the stream and 12 has two ponds on it so you really need to choose the correct club. After an uphill par 3 and a downhill short 4 you come to what I think is the toughest hole there(#15). The par 5 #16 is protected by a large wetland so you may need to lay up with your second shot or if you do go for it, stay left! 17 is a downhill par 3 with a huge green so hit it and give yourself a chance at par. Not a huge fan of the finishing hole here. If you miss your tee shot right you end up in their iron only range and your approach shot needs to stay right or your ball will end up down a steep hill. Of the 4 similiar courses in Orange/Woodbridge, I play Grassy the least due to them not having any deals or tee times online. Fox Hopyard is a semi private course on my top 3 list. The Roger Rulewich designed course is in East Haddam which is about 20 minutes inland from Old Lyme. The entrance takes you in along side their 5 acre pond with a glimpse of the 18th green. A classic New England style clubhouse sits atop a 30ft rock ledge over looking the 9th/18th greens and the range. Wedged between holes 9 and 18 is the best range in the state which is enclosed by dense fescue lined hills. The fox starts you out with the easiest par 4 all day. After that you will face a tricky uphill slanted par 4 then a tight uphill par 5 both requiring carries over wetlands. Hole 4 is a par 3 that drops 90 feet onto a huge green. With 7 tee boxes club selection is crucial as being long will leave you on a downhill slope above a downhill sloped green- good luck. I suggest you lay up twice on the par 5 5th and then get aggressive with your tee shot on 6. With more hazards than fairway, hole 7 fits the 1 handicap perfectly. The 8th is a beautiful par 3 that is all carry over the lake onto a wide yet narrow green. Rounding out the front is a short 4 with a multi tiered green. After your hot dog at the turn its off to hole 10 which is almost identical to #1. 11 and 12 are both protected by wetlands in front of the green. Hole 15 is a long dogleg right par 5 that would challenge players on the tour. The 16th is a long par 3, keep it to the left and hope you get a nice kick onto the green. 17 sends you out, setting you up for the BEST hole in the state. The score card says 528 from the blues but if the tee box is up and you get a good roll on your drive it leaves you with a tough choice. Either way you will need a precise shot, as that large lake you saw coming in looks even bigger now. Grassmere is a nicely landscaped nine hole course in Enfield. Surrounded by large farms, it is a perfect place for a casual outing. It plays relatively short but does have a decent amount of brooks running through it that can cause your strokes to add up. I am not a fan of the severely sloped par 3 ninth but besides that the course is fun and you can see they take pride in keeping it clean. Overall it gets a 6.5 and is a great value. The course with no website. A day or two before playing a course I would look it up to scope it out, find the best rate and book a tee time. With a nickname “Mr Google” I thought I would get some dirt on this course but the only thing I came across was the fact that it was pretty much on its own island. My GPS took me through the beautiful downtown Old Saybrook (stop in to Essex Golf if you have time) and then over a long low bridge to Fenwick. Although Fenwick is connected by land, taking bridge street makes it feel like an island. After checking in at the starter shed, it was time to tee off. Hole 1 is a straight away par 4 and is the worst hole there so don’t worry. To get to hole 2 you need to walk through a neighborhood block which will then open up to views of the sound. Hole 2 is my favorite hole there. Its a decent length par 3 surrounded by bunkers, a mansion behind the green, and Katherine Hepburn’s home on the right. Although not right on the sound, the tee box provides a view of it over the lake and marshlands on the right. 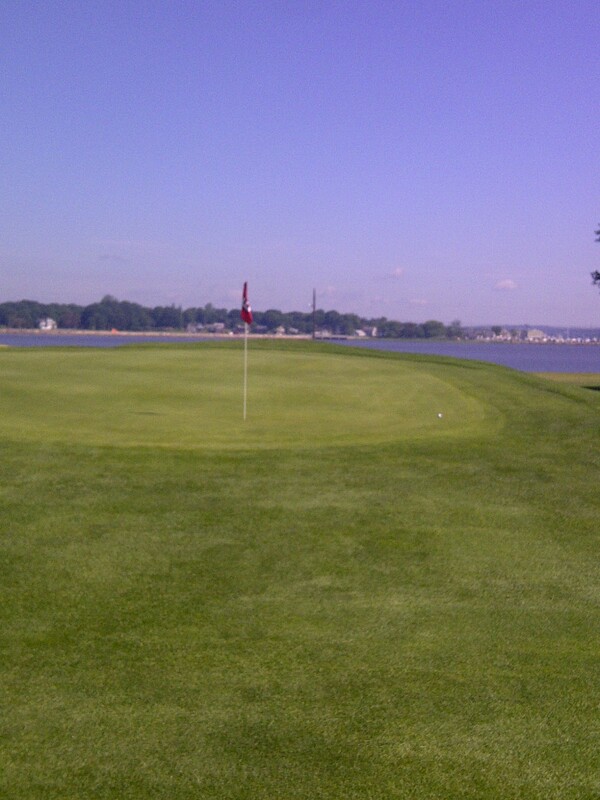 Hole 3 is another par 3 with an infinity green(pic below-birdie). Next up is another great hole, closing out what I think is the best trio of holes in the state. The tee box is on the edge of the “island” and forces you to carry the sound to hit the fairway. Overall this is a great course on CT’s shore and fun for low and high handicappers alike. Great late afternoon date spot before an early seafood dinner al fresco. If I wasn’t on my way to Pequot I would have played it again. Overall it gets a 7.5 which is high for a 9 hole course and I tell everyone they need to check it out on a nice summer day.